It’s not easy to catch a ride on a holiday-themed Port Authority bus. Once a bus is decorated, it generally stays with the driver who did the decorating. 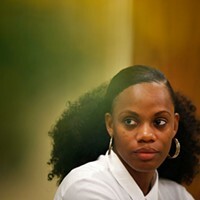 Drivers often work two or three routes in one day, and the bus is often in service seven days a week while the driver is not. So, another driver operates the holiday bus for a few days. 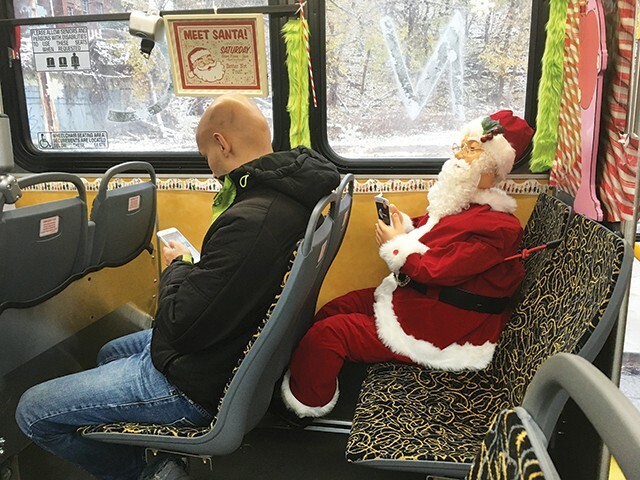 Riders on social media have spotted holiday buses on the 87, 64, 54, 41, and several other routes. This is all to say there are many factors that can affect the odds of getting a tinsel-lined bus. The uncertainty is for the best, though; the most rewarding way to interact with a holiday bus is by surprise. Holiday cheer is ubiquitous this time of year. Stores, bars, lawns, and anywhere else that could be decorated with tinsel and ornaments is indeed decorated. Public transportation is no exception. Port Authority buses typically look the same year-round, differing from each other only slightly in seat color and variety of candy wrappers left under the seats. Around ten years ago, a Port Authority driver asked for permission to decorate their bus for the holidays. Three years ago, other drivers caught on and now at least five buses are decorated for Christmas. There are also two T cars decorated for the season. “I think that bus operators are people, too, and they like to see holiday decorations,” says Port Authority Public Relations Manager Adam Brandolph. If a bus driver wants to decorate his or her bus for the holidays, they have to get permission from a supervisor. All the decorations are paid for by drivers out of their own pocket and are often leftover home decorations from previous years. "People aren't expecting it. It's the time of the year where it's cold, the days are shorter, and if this very little thing brings about some joy to someone's day, it's just that much better," says Brandolph. This holiday bus favors the Grinch. 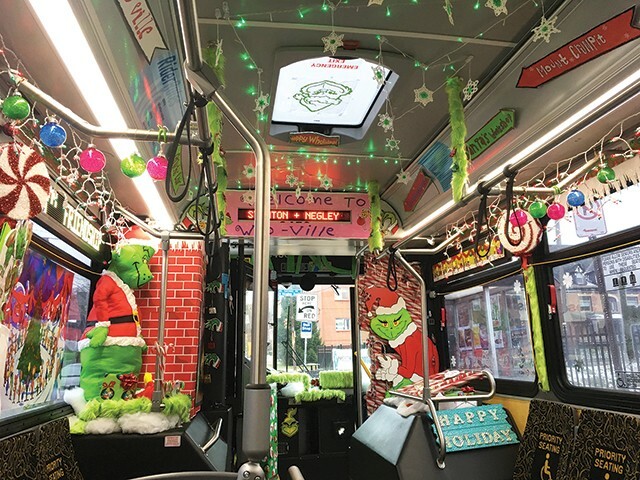 One of the buses is Grinch-themed, with a grinning Grinch on the bike rack, a Grinch blow-up doll, a "welcome to Whoville" sign, string lights, a small TV playing a Christmas movie, and a large Santa figurine casually sitting in a seat, propped up by bungee cords. Others are more modestly festive, with tinsel wrapped around the poles and snowmen adorning the walls. While there are no Hanukkah buses, Brandolph says there is at least one bus that has "Hanukkah elements." 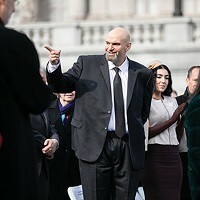 As zany as the decorating gets, Brandolph notes that there are still regulations the buses must meet: the accessible seats must be clear, the bike racks have to function, and there can't be any religious messaging tied into the decor. Christmas is currently the only holiday for which there are multiple buses decorated, but there was at least one bus decorated for Halloween this year, and Brandolph says Port Authority is open to any driver who wants to decorate for other holidays. The buses started roughly a week before Light Up Night and will continue through the end of the year.